Now that summer seems to have come to an end, you are probably thinking a couple of things. You might be wishing that you had an indoor pool so that you could keep on swimming the whole year round or you might be thinking that it’s time to winterise your outdoor pool. Perhaps you have a maintenance contract with your local pool company, which will include closing the pool for winter, but if you are doing the work yourself here are some of the things that you should remember to do. 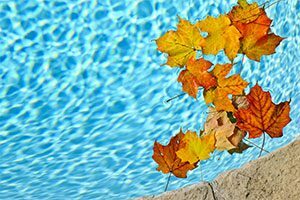 Before you close your pool down for the winter, you need to balance the water and treat it with the appropriate chemicals. Check the pH level and check the total alkalinity and calcium hardness. The ideal pH for a winterised pool is between 7.4 and 7.6. Getting the calcium hardness and total alkalinity right will prevent the pool’s surface from etching or staining. Shock the pool to approximately 10ppm and then add a long life algaecide, which you can get from your pool suppliers. Be sure to follow the instructions provided. Get your pool as clean as possible. Take off the solar cover and either store it away or leave it on the roller with a cover over it. Now vacuum your pool, backwash and rinse out the filter and clean the pump basket of any leaves or other debris that might be in there. Remove and store the skimmer basket and remove the plug at the bottom of the filter tank to drain the filter. Remove the drain plug, lid and basket from the pump and store them away. There are a few more jobs to do yet. If you have an automatic chlorinator such as one of the Etatron ePool units; drain it, remove the chlorine and flush it out. Disconnect the pool heater and remove the drain plug. If your filter is positioned below the water level, insert winterising plugs into all the pool circulating fittings and open all gate valves to drain the system. Lower the water level in the pool to allow for rainwater. If you have an overflow system you don’t need to do this. Only take it down about 6” below the skimmer and if you have any worries about there being a high water table in your area that might make a drained pool ‘pop’, then consult your pool supplier for advice. Put two or three large plastic containers half filled with water into the pool. These should float on the surface and, if the water does freeze, they should absorb the expansion and prevent damage. Now you can put the winter cover over the pool to keep out the debris and dirt for the coming winter. An alternative to a purely winter use cover is the Ultima system from DEL. Ultima is an automatic, four seasons cover that completely covers and secures your pool. Working as both a safety cover and a protection from debris, Ultima can be specified for a new build or retrofitted to an existing pool. If you already have have a slatted system, such as a DEL pool cover, you might choose to use their Ivernea winter shield as a layer of extra protection. Ivernea has a clip system that quickly attaches it directly to the slatted cover. The cover filters rain winter and traps debris.